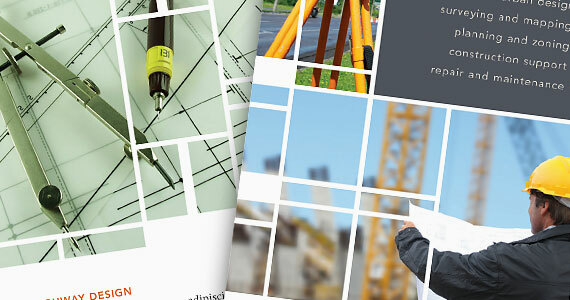 The basic foundations to designing successful print marketing materials are simple yet effective. These are the main design practices that we abide by when we create new designs for the StockLayouts template library, so when it comes to producing your own marketing materials whether you are starting with a blank page or using a template you can’t go wrong if you follow a few basic rules. Gone are the days of conventional typesetting and Letraset, where experimentation was costly and sometimes unjust. Most graphics professionals have a considerable font library at their disposal and a big mistake is using too many different fonts in a single design. A safe and simple rule is to stick to a single font family for the body copy and choose a complimenting font for headings. Select your fonts the way you would when choosing a photo, all fonts have a personality so consider their characteristics and ask yourself if it suits the piece you are working on. eg: a conservative business = a conservative font. Also, consider the point size and make it legible because after all, the purpose of a font is to be read. Say it, don’t scream it. The term “full-color” printing is not an invitation to produce blinding technicolor rainbows of paper. The impact of the marketing piece should come from your message or an image selection, good color choices will help compliment what you are trying to communicate. There are many helpful resources for choosing colors available to designers, keep an eye out for design publications like GDUSA magazine that produces an issue annually on future color trends. It’s not what you put on the page, it’s what you leave off. These words of wisdom should ring true with all your marketing and advertising pieces. Get to the point of what you are trying to communicate by being clear and concise in both your message and how it looks on the page. Imagery, be it photos or artwork play a vital role in graphic design communication. People are very visual and good choice of photography or illustration will help draw the reader into the nuts and bolts of the content. A good use of “white space” is also a given, you are probably over communicating when the page looks too crowded and you’ll lose structure and have no focal point when every inch of the page is covered in content. Brand awareness and business identity are not just for the fortune 500s. All businesses large or small need a personality that people can relate to and be associated with. A good logo is key to the identity of any business. It should be relevant and leave an impression that makes it recognizable when seen again. When creating our StockLayouts graphic design templates we always produce them in matching business sets with a complementing logo throughout all the printed materials. The key is consistency. Look to the competition to see what are they producing by way of print marketing materials. Your job as a designer is to make your business or client stand apart from them. Understand what the purpose of the piece is you are designing and whether you are communicating the product or service successfully. Keep yourself in the loop within the design community and seek feedback and share ideas from others before you print a piece of collateral. Be aware of trends in design and the industries of the business you are designing for and above all, always think, feel and be creative.